Only 30 percent of new World of Warcraft players ever make it past level ten, according to Blizzard CEO Mike Morhaime, who also revealed an even more chilling statistic: The game has stopped growing. MMOGs are the kind of game you play for either a very short time or a very long time. Gamers who become sufficiently immersed in one online game or another can spend literally years playing them and, more importantly, faithfully paying their monthly bill. The trick is getting people over that initial hump, which as it turns out can be a tough sell even for the mighty World of Warcraft juggernaut. "Our research shows that trial players who play World of Warcraft past level ten are much more likely to stick with the game for a long time," Morhaime said during Activision Blizzard's year-end financial call. "Currently, only about 30 percent of our trial players make it past this threshold. So anything we can do to improve the new player experience is a huge opportunity for us." "With Cataclysm we will be overhauling the early gaming experience for players, bringing all of the content in World of Warcraft up to our current design standards and ensuring that even new players to the game will experience the best work of our development team," he continued. "This will also provide additional replay ability for our veterans players as well. In the long run, we hope that this effort will capture more players and drive continued growth." I have no idea how the average MMOG performs in this regard but a 30 percent rate of retention seems pretty low to me. Even more shocking, however, was news from the House of Warcraft that the most dominant game in the genre has finally stopped growing. There are currently 11.5 million World of Warcraft subscribers, Morhaime said, the same number of users the game had in December 2008. 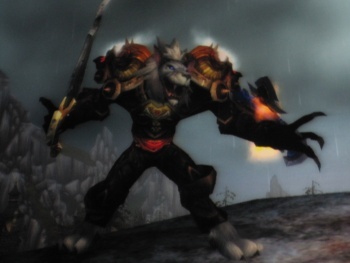 Blizzard remains upbeat about the game's future, however; the release of Cataclysm is expected to get those numbers moving again and the huge Chinese market, where Wrath of the Lich King has not yet been released, currently makes up about half of the World of Warcraft subscriber base and represents a tremendous opportunity for future growth.